Chemistry: Mg9(SiO4)4(F, OH)2, Magnesium Silicate Fluoride Hydroxide. Uses: rarely cut as a gemstone and as mineral specimens. Clinohumite is a mineral found as small grains in the marbles of contact metamorphic environments. It was first discovered in the metamorphosed limestone blocks that were ejected by the volcano Mt. Vesuvius, near Napoles, Campania, Italy. 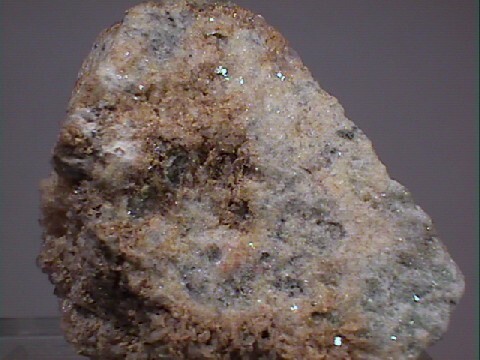 Clinohumite is a fluorescent mineral and will glow a tan to yellow-orange color when subjected to shortwave UV light. It is similar in fluorescent color to the bright humite material found at Franklin, New Jersey. Humite is a related species to clinohumite as might be expected by their names. Clinohumite is named in allusion to its monoclinic symmetry as opposed to humite's orthorhombic symmetry. Clinohumite's structure is often intergrown with humite's structure in the same crystal. Clinohumite from Pamir Mountains, Tadzhikistan, Russia has been cut as a brilliant yellow-orange gemstone, but it is rare and sought after only by collectors. This formula distinguishes the chemistry of the two types of layers. The most common member of the Humite Group is chondrodite which has two olivine layers between each brucite layer. Humite, the namesake of the group, has three. Color is yellow, red, brown or orange. Crystal Habits include small prismatic to rounded crystals, but as is most commonly the case, as embedded indistinct grains. Lamellar twinning is common. Cleavage is poor in one direction, basal. Other Characteristics: Many specimens (usually those that are of a lighter color) fluoresce a yellow-orange color under shortwave UV light. Crystals are pleochroic from yellow to colorless. Associated Minerals include humite, talc, geikielite, lazurite, dolomite and calcite. Notable Occurrences include the type locality of Mt. Vesuvius, near Napoles, Campania, Italy as well as the Pamir Mountains, Tadzhikistan, Russia; Pargas, Finland; Llanos de Juanar, Malaga, Spain; Tilly Foster Mine, New York; Fort Defiance, Apache County, Arizona; Crestmore Quarry, Riverside County and Lower Lake, Fresno County, California; Luna, New Mexico and Franklin, New Jersey, USA. Best Field Indicators are color, associations, fluorescence, environment of formation and hardness.